Ubisoft recently announced that the co-op for Assassin's Creed Unity would not be coed. Amid the reasonable backlash towards this development, as well as Ubisoft's response, there seems there is a group of people who "don't see what the big deal is." Well, I hope that reading this quick little primer will allow these people to see why people are so distressed about the Unity situation. The Assassin's Creed games have been excellent at creating casts of diverse characters, especially in their multiplayer offerings. In multiplayer there are a wide range of avatars to choose from, each from different backgrounds, ethnicities, social classes, occupations, and sexes. Then Ubisoft announced Unity would be ditching multiplayer for co-op and that the co-op would have customizable avatars, it was safe for people to asume that they would be able to chose as a woman to represent them. The choice to restrict players to male avatars was oddly out-of-character for the same series that allowed them to play as a native-American woman in multiplayer a few games earlier. Assassin's Creed's creative director Alex Amancio explained that the female avatar was ultimately cut because "It was really a lot of extra production work." He explains that adding a female avatar would have doubled the work and resource load. The amount of work needed to create a female avatar was so high, Ubisoft had to cut her. This excuse has been debated, and while I can't verify whether or not Ubisoft's claims are the truth, it is clear that somewhere along the line Ubisoft dropped the ball. It could have been in planning, budgeting, or any other number of things, but that is not what was important. 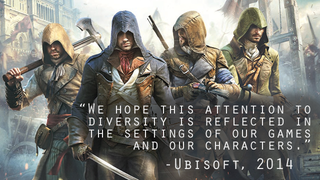 Instead of owning up to their mistake, Ubisoft delivered quite possibly the weakest excuse they had. Let's not forget that these are the same people who, just hours earlier, had been boasting that Paris would be the largest city in the Assassin's Creed franchise yet, featuring higher detail, more indoor areas, and a completely 1:1 Notre Dame. The whole idea that a female avatar cut as a "reality of production" because it required too much work seems like a sorry excuse after seeing how much effort other parts of the game received. The most bothersome aspect of Ubisoft's excuse is that it come with a worrying message: Ubisoft just couldn't be bothered to make a female avatar. All those fans who wanted to create a literal lady killer? All those women gamers who wanted to have an female avatar to represent them in-game? All those people who wanted just a little more diversity? Ubisoft didn't think it's worth the effort. I'm not sure which is worse, Ubisoft lying in an effort to hide mistakes they know they've made, or Ubisoft telling the truth and that they just don't care enough. Ladies and gentlemen, if that is not something worthy of controversy, I don't know what is.